There are some people who never seem to get old. Their bodies might age, but something in their eyes and heart has remained or even grown. Then there are people who seem to crave death. Sometimes it is depression. Often untreated, under supported and dealing with the loss of a great deal. I have been the supporter of an older relative dealing exactly with this. Without support and indeed medication these folks become something dark and unpleasant. As The Veil grows thin for a person you start to see what might be beyond for them, a light or a darkness. This is not about religion or faith but an almost physical psychic presence around people near the end. Those near their light glow. There is a peace and beauty. Then there are the other ones. A presence like black sticky smoke. A smell of something rotten or burnt like old tires or something sickly sweet. It seems to pour from them. I can not tell if it’s their mood, their energy, their internal mean-spiritedness or the manifestation of something else. Older people are just that, people. They are neither saints or devils, but dealing with someone whom is dark and difficult because they are family is hard work. It is often hard physically, emotional and spiritually. So how do you live with or be around this polluting force? Toxic parents, and relatives become no less pleasant as they age and some just use their frailties (real or imagined) as weapons to brutalise their children and spouses and grandchildren. As a child of a toxic parent and one who watched someone become one in their last years of life there is a complex soup of horrible feelings. Guilt, duty, blame, shame, fear and pain. As a witch I have to change my perspective. I must squint at the situation sideways and think magickally. Firstly the mundane. Is this person mentally ill? Are they depressed, grieving or suffering in some other way? Is mental health support possible? Many older folks have still have a lot of shame and misconceptions about mental health. Many have some really ugly or difficult coping strategies. From alcohol and cigarettes, to shutting themselves away, generationally we are in a much better place to understand mental illness today. Some might be struggling with side effects of medications, not knowing that their could be newer better medications or combinations out there. Some might not have been to the doctors at all. Avoiding what they think will be a frightening truth. Reach out. Find charities and professionals that listen not only to what they say but your input too. It isn’t easy. We had a lot of doctors simply refuse to believe Pop’s had depression. That many of his other issues would have been solved if they treated that first. In the end it was as much that as his vices that killed him. Of course you can not help someone who doesn’t want to be helped. This is perhaps a hard truth of our own we must face. The other option is also mundane and really tough. Sometimes you have to walk away. For your self, your health, sanity and well being. This might be a break, this also might be an end to the relationship. It is not our job to watch someone destroy themselves. If neither of these two are applicable (life is complicated and messy) protect and cleanse yourself and space as often as you can. You might want to physically clean it as well as smudge. 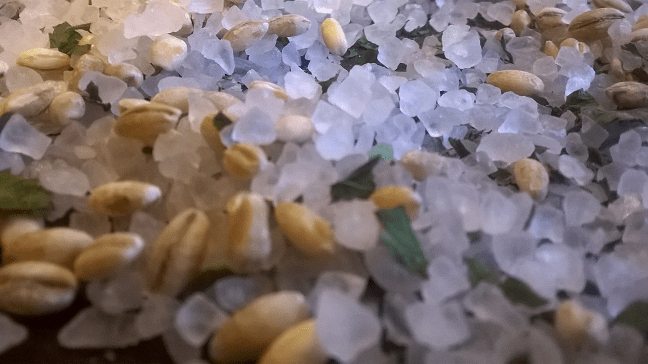 Adding salt and essences to your wash water can help. Protective wards, charms and crystals help a lot too. There are a couple of things that can help absorb some of the toxic seep but they are not permanent measures. One is sacrificial house plants. Sounds macabre I know. House plants tend to die in the presence of such people, yet these little heroes can and do take much of this and convert it as best as they can. They don’t have to be fancy, and if you get a few you can rotate them around (increasing their lives for a short time). Ferns are good. One near where they sit, one in their room, one in the loo or near where they spend a lot of time and absorb a lot of yuck. Some quartz pebbles might even make them live longer. The other is a salt and barely mojo. You can make up a big batch and keep it in a jar and change out and throw away the used one. How often depends on the person. Once a month or once a week depending on how bad it is. This can go under a mattress, or sofa cushion or even into a pillow. Salt, the best kind you can afford. 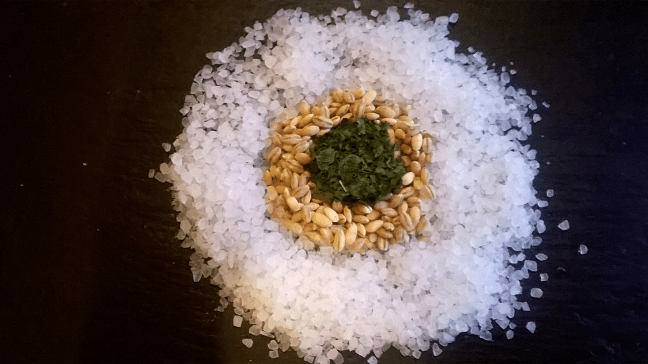 Per one cup of salt you will need a tablespoon of barley and calendula oil with a teaspoon of parsley. This is the base mixture and you can add other things, like moss or wheat straw (again to absorb the energy). Draw what is harmful away from me. Bind it here until I wash it away. Place in fabric mojo bag as discreetly or not as you like. Under the sofa cushion, or mattress is useful and make sure to empty them regularly. Dispose of the used mixture down an outside drain with plenty of water. Don’t put it in a river, but you could put it in the sea. This mixture can be used for a circle ward around your home, too. While none of this deals with the cause of the problem sometimes all we can do is muddle through and keep ourselves safe. In an ideal would this sort of thing wouldn’t need to happen but the world is often not ideal and we need to use our magick to keep us as safe as we can. Toxic relationships are difficult and draining and it can take a long time to heal from them. If a little magick can help you feel strong enough to say “no” when you need to then it has done you a great service. Crystal ball are used for divination (scrying) and spirit summoning. It is a well respected technique of divination and is used through the use of reflective surfaces and taking advantage of the bioplasmic energy (psychic power) in inanimate objects like crystals as it comes from the cosmos itself. If you can tune into that force the crystal ball will be very beneficial. They should usually be made from clear quartz and can be large or small. Smoky quartz is beneficial if you mainly want to use it for summoning spirits. Manmade crystals are spiritually dead, so use those only for decoration. Natural crystals are what you want. Some people think it is better to be given one as a gift, but personally I think you should choose your own. It is a very personal object so you want to choose it carefully. You should be drawn to it and feel its energy. The crystal ball is a tool of Pisces and the modern clear round ball is effective because it evokes the image of the moon. Now, some people can’t afford a real crystal ball, but there are other options. Even using something like a glass bottle of water, ink or water in a pan, etc. will give you some results, but the power of a cleansed crystal ball will be much more substantial. A new crystal ball must be cleansed by exposing it to the light of the full moon at least once (13 times is ideal) before use. A crystal ball covered in negative energy and spiritual debris will cause disturbances and may not be accurate. Also, when you are not using it, you should keep in covered in a dark cloth. 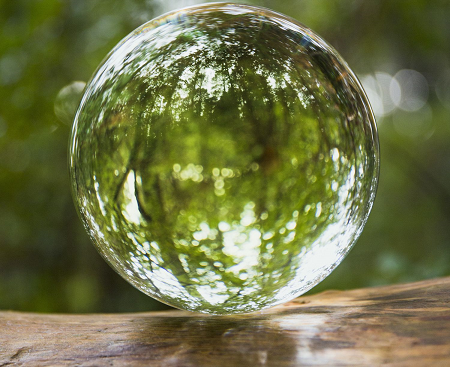 A great way to clean the crystal ball is with a blend of spring water and vinegar, charged waters, mugwort hydrosol or a water-based herbal infusion with dried mugwort and/or anise-seed. Crystal-gazing is a great way to get into clairvoyance. You should stand the crystal ball on a black base or black cloth so that when you look into it there are no distractions. You don’t want anything to draw your attention away. The lighting should be behind you and it’s best to be in a semi-darkened room. Close your eyes and try to empty your mind and be open to the energies and aura around you. Then open your eyes and gaze into the center of the crystal. When you see a shadow or shape, clear your mind and follow them. You may immediately see someone or something or you may see it fill with smoke. The smoke will probably fill up the whole ball and then start to dissipate and leave a scene. This is called clouding. If you don’t get anything, don’t worry. Keep looking for about ten minutes, but not much more. You don’t want to force anything or strain yourself in anyway. Just give up and try the next day. You will develop your own way of working with the crystal ball. Some see images right away, but sometimes you may need to try for a few days and weeks. Do not strain to get results, just relax and let it happen. At first you won’t have much control over what you see, but as you progress you will adjust and you will improve at clearing your mind and you will start to see what or whom you mentally ask for. If you are constantly getting negative or scary images or feelings you may want to try cleansing it again, cast a protective circle or simply try a different type of divination. Crystal balls just aren’t for everyone. Keep in mind when attempting to communicate with spirits, you should always cast a circle first. Hi everyone and Happy New Year!! 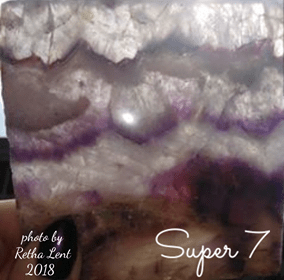 I want to start off this year telling you a bit about both super seven and auralite twenty-three. These are two of my very favorite crystals because for one they are absolutely stunning, and secondly they are the ultimate multi-taskers as they contain many minerals in both and therefore contain the properties of all the included minerals! How cool is that?! You can wear just one piece of jewelry and gain the metaphysical benefits of all the minerals you need! And to me the patterns and variety of colors included are so very stunning, I have never seen a piece of super seven or auralite twenty-three that I haven’t loved! First lets talk about super seven. 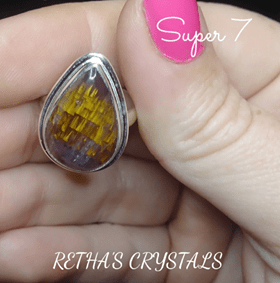 Super seven, just as the name implies, contains seven minerals. They are amethyst, smoky quartz, lepidocrocite, cacoxenite, clear quartz, rutile and geothite. All of these minerals alone are fantastic crystals to wear or use, but having all seven of these power stones in one is beyond wonderful. Super seven comes from Espirito Santo (which translates to ‘holy spirit’) in Brazil. It is still relatively rare and therefore expensive. It is also referred to as “Melodys Stone” and “Sacred Seven”. 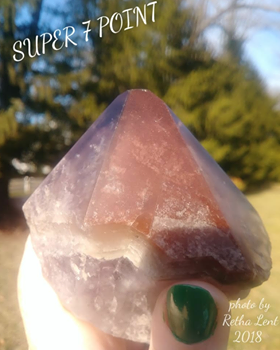 It can be purple, gray, orange, red, brown and clear.This crystal is known as being high vibrational and called a stone of higher consciousness. It is an enhancer of all types. 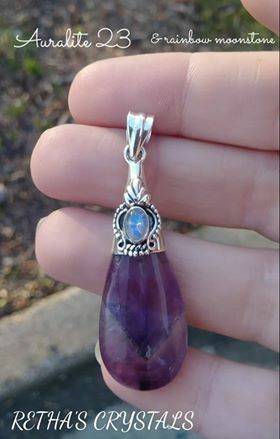 It aids in personal ascension, assists in development of all psychic gifts, aids in channeling, and brings souls into communication with the divine. It guides to help change the vibrational level of the whole planet! It links humanity. It aids you in taking the right path. It provides clarity of mind and revitalizes and clears the entire energy field. It clears the mind of distracting thoughts and anxiety and brings you to a sacred and tranquil realm. It clears & aligns all the chakras. It is great for all zodiac signs. It attunes you to its abilities to trigger development of psychic abilities to promote further healing of the earth and wellness on all levels. It provides universal protection and universal creativity. It guides and inspires creative life force. This crystal is healing, grounding, protective, powerful and transformational. A stone of expansion. It is a great stone for sleeping as it creates peace and harmony. It is perfect for crystal healers and meditation as it provides physical, intellectual and spiritual healing. It also creates stability during chaotic times. And it has the added benefit of heightening the vibrations of all other crystals near it. So as you can see, this is a super stone indeed. I could go on, but for lengths sake I will wrap it up….we still have auralite twenty-three to dive into! 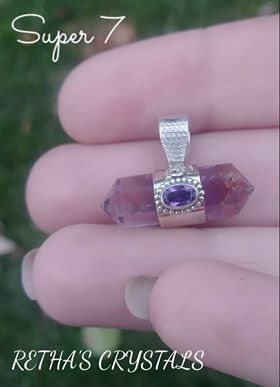 Also known as “Auralite amethyst” and “kindred spirit crystal”. 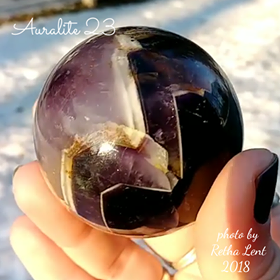 Auralite Twenty-three contains 23 minerals. Xray diffraction has identified these 23 minerals, though much is comprised of amethyst, citrine, and a rare type of green quartz. Keep in mind also that scientists cannot identify all of the minerals within, because a meteor dissipated into the crystal over 1.5 billion years ago and the minerals are not of this planet. Here are the 23 we can identify: titanite, cacoxenite, lepidocrocite, ajoite, hematite, pyrite, magnetite, geothite, pyrolucite, gold, silver, copper, platinum, nickel, iron, limonite, sphalerite, covellite, chalcopyrite, gialite, epidote, bornite and rutile. Wow…what a combo!!! This crystal is a newer find and only comes from Canada. It is mined in the “cave of wonders” or Boreal forest in thunder bay, northwestern Ontario. It is one of the very oldest crystals, more than 1.5 billion years old. It can be gray, purple, clear, orange and red in color. It can also display beautiful etching and chevron phantom banding. This crystal has an extremely high frequency and an abundance of properties. It is a stone of new consciousness. It can even be too strong and intense for some (much like moldavite). Being grounded is important when working with this stone. It is a master healer and is meant to be used. This stone is meant to change both your life and the world around you for the betterment of mankind. Its used for code clearing, DNA healing and cellular activation. It also activates spiritual DNA and the pineal gland. It reminds our bodies of its proper vital functions and brings forth regeneration and rejuvenation. 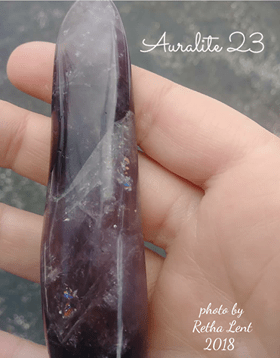 Auralite 23 aids us in spiritual evolution, and enhances all spiritual and psychic gifts. It helps with communication with spirit guides, angels, ascended masters, and source energy. It is great for astral travel, lucid dreaming and accessing the akashic records and past lives. It can heal the inner child and help release old karmic patterns. This crystal balances and activates all the chakras and even the chakras above the head and below the feet. It balances and awakens kundalini energy. It aids us in self-acceptance and self-confidence. It can also revive our lifeforce, relax the body, remove tension, and relieve headaches and muscle spasms and pain. It can help to end bad relationships and create a healthy long lasting one. It can help to create a divine line from you to your twin flame. 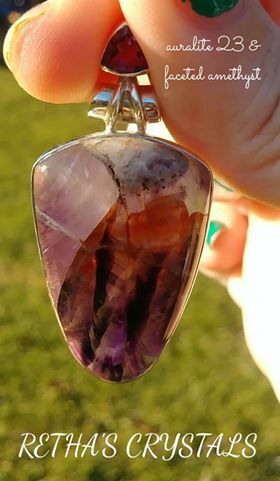 Auralite 23 is perfect for healing, meditation, deep soul work and exploring ones own consciousness. As you can see from the huge amount of properties each of these power crystals have (and this is only some! ), they are both very special crystals. If you can get your hands on one or both I highly recommend you give them a try! Thanks for taking the time to read and I’ll see you back next month! Crystal Blessings and Happy 2019! Cover art: You can find Christmas Winter Faerie by Janna Prosvirina on the etsy shop JannaFairy where it and many others are available as Coloring Pages. Janna Prosvirina’s Coloring Pages Freebie!! As a Winter Solstice Gift, Janna Prosvirina is giving our readers a holiday present of a free coloring page from her downloadable Coloring Book titled Winter Magic. We hope you enjoy coloring in your Winter Magic Witch, to purchase the full Coloring Book Click Here. For your Free Coloring Page Click Here. Welcome to the Yule Issue of PaganPagesOrg. And a Happy Winter Solstice to You All!! We have an Issue Full of Reviews for You this Month on the Best Items for Yule!! The 2019 Lunar & Seasonal Diary by Stacey DeMarco is Not Only a Work of Beauty & , But Our Reviewer Thinks “It’s A Great Notebook for Any Pagan…Keep One in Tune with the Seasons, and it Especially Shines for Those New to the Pagan Path.” Come and Read What Else He Has to Say. You Know When You are at a Craft Fair and You Just Find That Oh SOOO Right Booth, Product, Seller? Well it Happened to Me!!! I Met Anna Maria and Her Shop, Hokum Wares. From the History of Altars, & Traveling Altars, to Ideas You have Never Thought of ‘The Witch’s Altar’ Has so Fully Covered the Topic of Altars It is Sure to Give you New Ideas on Creating the Perfect Sacred Spaces in Your Home. Faery Witchcraft, by Storm FaeryWolf, Provides the Reader With an Inside Look at the Workings and Traditions that Evolved From Victor and Cora Anderson’s Feri Tradition and are Known as Faery Witchcraft. …And of Course We Have Not Forgotten Your Yule ! And so much more! Get to reading!!! Thank you so much Everyone!!! Join us on Facebook, Twitter, Pinterest, Google+ Community, Instagram, & YouTube. The things you take for granted someone else is praying for. Author, Storm Faerywolf’s book provides the reader with an inside look at the workings and traditions that evolved from Victor and Cora Anderson’s Feri Tradition and are known as Faery Witchcraft. I am always skeptical of books that infer that the teachings within are those which are not freely shared. It gives a certain layer of mystery and feeling that the reader is privy to practices that are only shared with the most trusted. I am not saying this as judgment as to whether that word “forbidden” or “hidden” should be in the title of any book, just simply making a statement relevant to my experience in that what is truly only for those with the appropriate training is never shared fully in a book. I believe that by having that bit of information, the reader can then make use of the material presented to the best of their means. And, so on that note, Storm has treated his readers to “just enough” information to whet the appetite to learn more of the BlueRose lineage of Faery. I am familiar with his work, having read Betwixt and Between: Exploring the Faery Tradition of Witchcraft and having had the privilege of attending ritual and class with him at the Temple of Witchcraft “Templefest” event year before last. I loved that he dedicated the book to Victor and Cora Anderson and acknowledged that all great works set upon the path are the result of collaboration and the impact of many teachers, students and others who support and encourage the individual’s practice. That was also true of my impression of him in first meeting, that this was a genuinely very nice guy who was passionate and dedicated to both sharing and evolving his teachings to be inclusive. Unlike Storm’s first book, Forbidden Mysteries is a bit darker in its magick; really getting to the heart of practice, ritual and exploring those aspects of witchcraft that require courage and boldness. The appendices provide the basics of Faery practice, some beautifully written poetry and invocations for use and the role of the Divine Twins in the lore of the Faery. Additionally, there is a glossary, which is a wonderful addition, again, making the material much more accessible to those who do not follow this path of witchcraft and would be otherwise unfamiliar in understanding some of the concepts. This book is chock-full of exercises of preparation, Rituals, spellwork and Chapter Five’s exercises move through the alchemical elements finding common ground within all practices of witchcraft, but most decidedly with Fae influence. …. While there are many different legitimate spellings for our particular tradition in use (most notable “Feri”, though Faerie, F(a)eri(e), and even rarely Fairy sometimes appear) I tend to use the archaic “Faery” as it was the spelling used at the time of my introduction to the tradition, and I also feel it better poetically evokes the relationship between the practitioner and the fae; a detail of mytho-poetic practice that some lines of our tradition do not follow but is central to my own practice and my lineage of BlueRose…. (excerpted from the Introduction). This simple statement clears up much misconception about identification of the Fae and the Traditions that honor them. The book is separated into four parts, taking the reader through many topics that are the staple of any practice of witchcraft and carefully aligning them with communion and understanding of the world of the Faery. We are given fair warning about the true nature of witchcraft and the dangers that lay in interactions with any who walk those realms, but as the author states, not for the reasons stereotypically associated with the practice. The danger lay in what is revealed of ourselves in the process and whether we have the courage to embrace all parts of our being and the places that those aspects inhabit and interact with those who are of the greater Earth or even more distant realms of existence. These pitfalls are exemplified in the telling of stories of the descent into madness by those who wandered into the realms of the Dark Faery and were not prepared for the price to be paid. The truth of the witch’s path is one of facing the shadow of their being as well as the light and in so doing being able to reach into the darker abyss where those greatest allies and teachers of the Fae reside. We learn that the Faery are not the whimsical winged beings that tales have provided, but are often in folklore associated with the darker nature of things, not much different than the many layers and types of humans we encounter. Each has a dark nature and depending on the situation shows it in its ferocity or lessens the sting in resonance to the finely tuned calibration of the human encountered. Each chapter and section following gives the information necessary for those who wish to cultivate an understanding and relationship of sorts with those beings of the Faery. I found these offerings to provide a perspective of work and a tradition that encompasses nature in her wholeness. We are reminded of the darker aspects of all of our spiritual work and that greater knowledge of what we consider to be demons and goddess of primal origins are part of the entirety of our world and all others. I could dissect each chapter and point you in the direction of specific rites or exercises, but to a large degree that would spoil the unveiling of what should be an experiential journey of your own devising. Storm provides you with the tools and what you make of them and how you arrive at your own conclusions about the Fae is yours, and yours alone, culled from your courage and your boldness. This book is definitely one to be added to any library of a practitioner of witchcraft. Not simply in adopting its tradition as your own, which may well be the case after reading and exploring further, but in keeping with the true definition of a witch-one who seeks knowledge of the natural world-and I would add… and in so doing, gains the greatest gift of all, knowledge of themselves in all of their parts. Robin Fennelly is a Wiccan High Priestess, teacher, poet and author. Follow Robin on Instagram & Facebook. As someone with many altars strewn about my home, I was happy to have the opportunity to read this book. Whether for a beginner or someone with many year’s experience with Wicca/Witchcraft/Paganism, this book will help you in setting up, designing and maintaining your altars. Just perusing the Table of Contents makes you aware that the two authors know exactly what they are talking about, as they have many years of wisdom and knowledge both individually and collectively. It is a very reader-friendly book, conversational and easy-to-read with much information packed between its covers. The book starts by relating different kinds of altars, i.e. shrines, temples, sanctuaries, etc., with descriptions for each. The history of altars is here beginning with those first caves and stones, what they contain(ed) and how altars became one of the magical tools most relied upon. All of the details are present from what an altar is, what it is for and how to build one. Since there are various reasons to build one, the authors discuss the specifics, such as what activity you will be using it for, such as devotion, ritual, spell-work. This includes tips on deciding where to build it, keeping in mind what you are looking to do. Specific altars are always reviewed, such as, daily and seasonal altars, as well as outdoor altars and devotional altar dedicated to specific diety(ies). One of the things I liked most about this book was how each author readily shared personal experiences with the reader. Of specific interest was the section regarding altars for the dead and ancestral altars, something I have not read much about in other books. The information was fascinating and propelled me to make my own ancestral altar. For those of you who travel, locally and abroad, there is a section on travel altars, whether to set up at a hotel, or to have with you on a daily basis in your own personal vehicle. This includes digital altars, a concept I would never have even considered. Some of the topics had me thinking “oh, yes, I had not thought of that”, such as dealing with our animal companions climbing all over our altars, other people who feel the need to touch, and how to dispose of altar items that are no longer needed/wanted. This highly informative book is also interspersed with recipes both magickal and mundane, include spellwork, prayers, chants, blessings. At the end of each chapter is a section called “Altar-natives”, which features witchy friends of the authors adding their wisdom; in fact, giving us ideas from numerous people. A nice touch. Allowing for the disclaimer that I personally know Tempest, I would like to say that I highly recommend this book – friendly, informative, enjoyable. Harvest Magic Autumn Story Goddesses Handmade Statues crafted by Molly & Mark of BrigidsGrove on etsy. Brigid’s Grove is a creative partnership between Molly & Mark Remer who co-create original Story Goddesses, Goddess Sculptures, Mini Goddess Pendants, Goddess Grids, and Ceremony Kits at brigidsgrove.etsy.com. They also publish Womanrunes Books & Decks, based on the work of Shekhinah Mountainwater. Brigid’s Grove uses visual, artistic expression as a means of story-telling and experience-sharing to help you honor your story & to celebrate lifecycle transitions and pivotal life moments. Molly & Mark create art and ceremony in order to “tell about it.” You can connect with Brigid’s Grove through their Website, Patreon, Facebook, Instagram, Etsy, Facebook Group, or through their Free Everyday Magick Class. Brigid’s Grove Downloadable Coloring Page Freebie! As a free gift, Brigid’s Grove is giving our readers a free Wheel of the Year Coloring Page that you can Download Here. An Interview with Author of ‘Pastel Spells’ & ‘Of Witchcraft and Whimsy’ (Both Reviewed in this Issue), Rose Orriculum who Shares Her Thoughts on Spell Casting & Cursing. An Interview with Wendy Steele, or Wendy Woo, the Amazing Witch Lit Author of the Ongoing Lilith Trilogy, the Standing Stone and the Lizzie Martin Witch Lit Series. Mabh Savage Reviews PracticalCandleMagick on Etsy’s Beautiful Spell Kit for Money/Wealth Drawing and Tells you How well it Works. Guest Writer, Amy Blackthorn, Author of Blackthorn’s Botanical Magic, Share’s the Magick of “Scents of the Season”. This Month “Worth the Witch” Found Another Great Subscription Box to Share with You and Just in Time for Yule! The Magickal Earth is a Box You Do Not Want to Miss. Last Month We Reviewed the Book “Faerie Stones.” This Month, We Introduce You to the Book’s Talented Author Ceri Norman in an Amazing Interview! Plus so much more. So what are you still doing here? Get to reading!! Thank you for enjoying us so much! Choosing to remain a solitary practitioner or joining a coven is a very personal matter. Both offer benefits and detriments. Even if you consider yourself to be a solitary practitioner, there will be celebrations and stages in your development that will generate a desire to share, commune and connect. Those who choose to join a coven will also have specific points in their path and or rituals that they may wish to celebrate or practice in private. Many Witches choose to walk a Solitary path. In former years this could be a very lonely, albeit a fulfilling one. We are fortunate to be on the Path at this particular time as there are many festivals and open events that both solitary and coven members can attend. Meet-up Groups that have a pagan flavor are in abundance throughout the United States. There are also many opportunities to take classes, workshops and attend conferences as many covens offer open rituals, workshop series and other events that allow solitary witches to interact and learn. For some, group work and the structure needed to have things run smoothly is too restricting and limiting. For others, jobs, lifestyles or family obligations prevent the individual from attending coven functions (there is usually a minimum requirement of events throughout the year that a coven member should be expected to attend, unless there are emergencies), and this creates stress for both the coven and the member. If ritual at 2am is all you can easily fit into your schedule, most covens will not be accommodating to that. Solitary witches often have a very creative bend. Because everything they do ritually or spell wise is generally self-generated and created, they become quite adept at improvising. Depending on the coven and Tradition you are interested in joining there will generally be a specific length of time and protocol specified to facilitate the dedication process. For instance, within our coven we require at minimum a six-month “getting to know you” period where the prospective dedicant (newly dedicated member) attends open events and interacts with the other members of the coven. The coven you select to petition for membership should offer a stable and fair structure with resources to further and enhance your personal growth. Working within the coven should feel like a spiritual family and these should be people that you trust to see you at your best and your worst. The energetic connection that you weave with this group of people will strengthen and build as you continue to work together. It is a very intimate process that requires respect between all of membership. The High Priest and Priestess of the coven should be people who live by example those teachings that they have been entrusted to pass along. There should be a comfortable exchange between leadership (HP and HPs) and membership such that any discord, or misunderstandings can be discussed and resolved in an ethical, intelligent and mature manner. There should be encouragement of all members within the group to excel and progress in their magickal studies. And, although healthy and constructive criticism are great motivators there should never be an ill-intended push or encouragement towards unhealthy competition for recognition, roles or initiations among members. It has been my experience, that frequently the people who are meant to become members of our group, find their way to us, either through a synchronistic moment. They happen to be in the right place at the right time, find our website and decide to come to an open event or become interested through a friend who is already a member. Don’t be afraid to be selective. Take the time that you need to make an informed decision and never allow yourself to be pressured into joining a group. If a group is that desperate for new members, there are most likely other areas in which they will exert or force their will on the existing members- the number one “no-no” in wiccan philosophy. The bottom line is that if the group is a viable and healthy one, they will want to take their time in getting to know more about the potential members who come knocking on their door, and if the fit is right there is no need to hurry matters, neither your nor their interest in having you join them will diminish or lessen. If it does, perhaps it was not the place for you after all. The commitment to a group should be entered with the thought that this will be a place of working and growing for several years. There is no short track to magickal mastery and those who frequently leave and join groups, as well as covens who have a fast moving revolving door usually do not stand the test of time and longevity. It doesn’t really matter whether you choose to join a coven or remain a solitary practitioner. The important thing is that you continue your practice. That you seek out the resources you are guided to when and where you are led. And, when the time is right, you gather with like-minded individuals as one in celebration of the Wiccan Path. Hello Hello my lovely Broom Closeted Sisters & Brothers! This is my third love letter to you all, slipped under your doors, and I thought I would cover the ever witchy herbs this month having covered flowers. Witches use herbs in all sorts or magick and mundane ways and you can, too, without anyone knowing you are using Magick! As you may, or may not know yet, herbs have meanings, magickal, and healing. There are many great websites and books with this knowledge and I am not going to get into all the herbs out there and their meanings in this article. This article is to show you how you can use them on the down low in your everyday life. Growing herbs is a great way to learn how to work with herbs. Many people grow their own herbs to cook with. There are many kits out on the market today that help you grow your own small herbal gardens to make it easier for you to learn. Even kids kits help to begin to learn. I start with children’s kits, and single pots. I find them easiest, since I have a black thumb, rather than a green one. They come with a tiny pot, seeds for your herb, and a dirt disk that needs to be soaked. You can find them in many stores or online. I have even found mine at the dollar store. But you do not have to start or stop there. If you are an experienced gardener, have at it! Go crazy, grow all your witch supplies! The first, most obvious way to use herbal magick is by Cooking. Did you know you can impart your intent in your meals and baked goods? If you look at the picture above you can see how the bottles labels say things like Money, Protection, Love… These are all magickal workings you can work into your food. The herbs you choose to place into your food can have a magickal effect on you and others. Be sure to look up ingredients you use. Or look up the ingredients in recipes to see what they mean. Then as you cook, concentrate your energy and your purpose to your cause. Or you can buy magickal culinary blends like the ones pictured above that are simply delicious. If you read the review of the blends in the article Worth the Witch you will see how I baked some love cookies using one of the blends. They filled my house with love, laughter, and happiness! They were also delicious! This is a great way to perform magick because no one is usually with us in the kitchen and a lot of the time the spells can be performed in our heads. Drop in your herbs. Stir your pot (cauldron) and cast in your mind! Did you ever think about wearing your herbs? I’m not talking about oils, though that is a great way to wear your herbal scents, as well. I’m talking about on your clothing. Sachets are a way to keep your clothing smelling lovely but also bestowing them with purpose. Lavender keeps you calm, magickally and medically, so add some lavender to sachets in your drawers or on your hangers in your closets with a quick chant about keeping you calm and anxiety free. Then as you go through your day you have the scent of peace about you. Take a nice sniff to remind yourself daily. For happiness try sweetpea, for love jasmine, or musk for courage. Whatever you feel you need more of, you can make up for in herbal scents. Everyone will just think you smell great! Ahhhh nothing like a relaxing cup of herbal tea! Between the magickal and medical correspondences of the herbs in tea the benefits are out of this world. But did you know that the types of tea themselves have correspondences? So now we can drink with purpose & a small chant in our heads! Homeopathic remedies are no longer thought of as wisewoman traditions anymore, so it is safe for us to use our natural remedies in public. So get out your herbs to help in healing yourself. A good way to heal a headache is lavender. You can find a lovely recipe for Lavender Lemonade on Eat Yourself Skinny. On a hot summer’s day, when your find yourself battling a headache, why not cool down with this helpful drink recipe? Growing certain herbs for their properties and placement in your garden can be very beneficial to your household. Placement of potted plants can be as, well. Like a nice Rosemary by a kitchen door for Protection to keep the baddies out. Did you know that planting Lemongrass, Lavender, Lemon balm, Basil, or Catnip can help keep mosquitoes away? So try to plant these around your outdoor gardens in abundance. Well, my loves, I’m going to lay out some herbal Pot Pourri for a house blessing, throw some Basil in my pocket for some money luck while I head out the door, and say Toodles for now. Jennifer Sacasa-Wright is simply a Witch. She runs PaganPagesOrg eMag. She loves hearing your opinions & thoughts on the eMagazine and welcomes comments. You can email her at jenniferwright at paganpages dot org. When she is not working on PaganPagesOrg she is creating in some other way & trying to make the world a better place with her family. Some of the magic is traditional while most is modern. I agree with Greywolf that “of all the mysterious forces in the universe, love may be the most powerful” and “love is hard to control.” I don’t agree that all the incantations, concoctions and charms offered to harness it are necessarily proper. Yes, love spells have been around “forever.” However, if something interferes with a person’s freewill, warning bells go off in my head. While it seems harmless, my ethics would keep me from doing it because it’s trying to get someone to be a good sister. Rather, I would find another way to address the situation. If I was shy or too intimidated to approach the person, I would do some magic to bolster my self-confidence and courage. I would also recognize that this woman may not choose to be a close friend for any number of reasons that may very well have nothing to do with me. Not knowing the person well, there could be something about her behavior that would make not being close to her actually be for my highest good and greatest joy. There is much to consider when doing a spell, and those involving others require the most thought and experience, which is why I caution people not to just pick up a book and follow some instructions without thinking through every detail and possibility. Other than being extremely squeamish about swallowing a chicken heart whole, I am also extremely squeamish about making a person love me. There are at least half a dozen ways I can see this go sideways. I see this as a form or manipulation. I also recognize my bias comes from how I practice and I acknowledge not everyone walks the same path the same way. Robi’s “Wedding Sachet,” and Greywolf’s spells “To Cure Pre-Wedding Jitters” and “For Bandaging Past Wounds” are but three more examples. Among the more interesting spells I found in the book was this one to love yourself. This is a spell to fall in love with yourself. Perform in times of need. Take a rock and break your mirrors. You don’t need them right now. Keep the rock and break your scales. Take some scissors and snip your measuring tape. Keep the scissors and cut your hair, no mirrors needed. Speak the words: It doesn’t matter. It will grow. Go for a long walk or get out of the house in whatever way you can. Use your body. Count the beats of your great heart. Find a reflective pool. If needed, fill your favorite bathtub and look into that. Speak the words: I have all I need. Smile at your reflection, blurry and imperfect in the reflecting water. Smile and smile and smile. For readers who want to craft their own spells, or modify one from “Love Magic,” the lists of colors, stones, herbs, essential oils and flowers found at the back of the book are helpful. There is also a section on love omens – from apples to wishbones – along with the meaning of various birds, a list of lucky days, and information about how each phase of the moon relates to love magic. As with everything in life, it is wise to take what you need and leave the rest. I hope you will do so with this book as well as all others that show up on your path. Lynn Woike was 50 – divorced and living on her own for the first time – before she consciously began practicing as a self taught solitary witch. She draws on an eclectic mix of old ways she has studied – from her Sicilian and Germanic heritage to Zen and astrology, the fae, Buddhism, Celtic, the Kabbalah, Norse and Native American – pulling from each as she is guided. She practices yoga, reads Tarot and uses Reiki. From the time she was little, she has loved stories, making her job as the editor of two monthly newspapers seem less than the work it is because of the stories she gets to tell. She lives with her large white cat, Pyewacket, in central Connecticut. You can follow her boards on Pinterest, and write to her at woikelynn at gmail dot com.